말이 필요 없는 장면이다. 흐르는 음악과 몰래 몰래 서로를 바라보는 시선이 너무나 아름다워 애인없는 사람은 배아파 미칠 것 같게 만드는 장면이다. 애인이 있고 마땅한 레코드 부스가 있다면 따라해 보자. And it says that loving takes its course. Have I never lay down by your side? You don't have to run away this time. Selene: Ow! Ridicule! (french for 'ridiculous') (Sees poster) Ah, there's an exhibition. Yeah, I guess we'll miss it. Doesn't start until next week. Jesse: Yeah, I think so. Selene: (indicates art shown in poster. Poster is of exhibition of art work by Seurat.) I actually saw this one a few years ago in a museum. I stared, and stared at it. Must have been 45 minutes. I love it. La voie ferée. Ah. (points to another work on poster) I love the way the people seem to be dissolving into the background. (Indicates another) Look at this one. Its like the environments, y'know, are stronger than the people. His human figures are always so transitory. Its funny. Transitory? Selene: Yeah, but I had worked for this older man, and once he told me that he had spent all of his life thinking about his career and his work, and... he was 52 and it suddenly struck him that he had never really given anything of himself. His life was for no one, and nothing. He was almost crying saying that. Y'know, I believe if there's any kind of G-d, it wouldn't be in any of us. Not you, or me... but just this little space in between. If there's any kind of magic in this world, it must be in the attempt of understanding someone, sharing something (sigh). I know, its almost impossible to succeed, but... who cares, really? The answer must be in the attempt. Jesse: Do you have any idea what they were arguing about? Jesse: Do you - Do you speak English? Selene: Yeah. No, I'm sorry, my German is not very good. Have you ever heard that as couples get older, they lose their ability to hear each other? 아주 사소한 기회를 잘 살려서 한편의 영화를 만드는 Selene과 Jesse. 어쩌면 둘 다 이 방면의 고수였을지도 모른다. 혹시 이런 사소해보이는 기회를 놓치고 있지는 않는지 생각해 볼 일이다. Selene: (thinks) Let me get my bag. 멋지다. 겸손함과 터프함이 밀크쉐이크처럼 섞여 있는 궁극의 꼬심이다. Scene 4 를 통째로 외워서 써먹자. Jesse: Alright, it's Q&A time. We've known each other a little while now, we're stuck together, so we're going to ask each other a few, uh, direct questions. Alright? Selene: So, we ask each other questions. Jesse: And you have to answer 100% honestly. Jesse: Okay, alright, first question. Jesse: (fakes a German accent). Describe for me (back to regular) Yes, I'm going to ask you. (German accent again) Describe for me your first sexual feelings towards a person. 둘만의 진실게임. 이처럼 첫빵에 던지는 강력한 질문이 뒤의 대화를 술술 풀어가게 해줄 수도 있다. 길거리를 지나는 사람을 구경할 때 얼굴이랑 몸매만 감상하지 말고 좀더 창조적인 시간을 만들어 본다. 하지만 위와 같은 대사를 수녀에게 적용할 때는 조심할 필요가 있다. Poet: So, I would like to make a deal with you. I mean, instead of just asking you for money, I will ask you for a word. Yeah, You give me a word, I take the word, and then, and then I will write a poem, with the word inside. And if you like it, I mean, if you like my poem, and you feel it adds something to your life in any way, then you can pay me whatever you feel like. I will write in English, of course. Poet: So? Pick a word. Selene: A word, uh... milkshake. Jesse: Milkshake? oh, good. Yeah, was gonna say rooster prick, but great. (turns to poet) Milkshake. 이것을 한강에서라고 못하랴? 이것은 애인이 없는 사람을 위한 영화 따라하기다. 자신의 시적 감수성도 키우고 돈도 벌고 멋지지 않은가? Selene : Okay, now I'm going to call my best friend in Paris, who I'm supposed to have lunch with in 8 hours. Okay? Selene : (With her hands mimicking a telephone, lifting it off the base, and putting it to her ear.) Dring-Dring. Dring-Dring. Pick up! Selene : Pick up the phone. Jesse : (also mimics a phone with his hand, puts it up to his ear) Oh, hello? Selene : Vanie? Ici Lina. Jesse : Ahhh...y' - a - I - y'know, I've been working on my English, recently, W - y'want to talk in English? Selene : Yeah, okay, that's good idea Ummm...I don't think I'm gonna be able to make it for lunck today. I'm sorry. I... I met a guy on the train. and I got off with him in Vienna. We're still there. Selene : And he's so cute! He has beautiful blue eyes, nice big lips, greasy hair, I love it. He's kind of tall, and a little clumsy. I like to feel his eyes on me when I look away. He kind of kisses like an adolescent, its so cute. Jesse: I don't think he's scared of you. I think he's crazy about you. Jesse: I mean, I've known you a long time, and I got a good feeling. You gonna see him again? Selene: We haven't talked about that yet. Okay its your turn. You call your friend. Jesse: Alright, alright. Umm...Uh, Bring-Bring-Bring. Uh, I usually get this guys answering machine. Brawwwwwwng. Selene: Hi dude, what's up? 자신에게 이성 친구 혹은 동성 친구가 생겼다면 한번 시도해 보자. 왠만큼 낯짝이 두껍지 않다면 시도하기 힘들테지만 서로에 대한 감정이 스믈스물 피어날 때 더없이 좋을 것이다. 기차에서 혹은 전철에서 마음에 드는 이성 혹은 동성을 만났다. BeforeSunrise처럼 멋지게 그 사람과 인연을 엮어보고 싶다. 그럴 때 최대한 BeforeSunrise의 수법을 동원한다. (특히 Scene 4를 참고하라.) 뭐 그럴 수 있는 상황이 벌어지기는 쉽지 않겠지만 보다 직접적으로 다가서는 방법도 좋을 것이다. 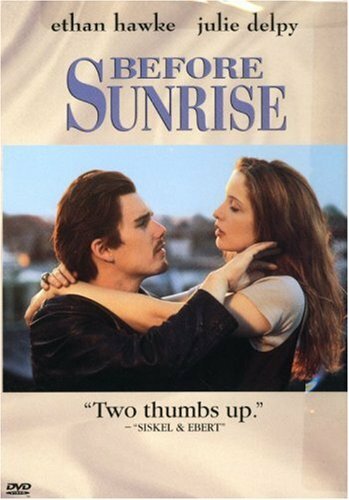 "저 혹시 Before Sunrise 좋아하시나요?" "하핫..그럼 오늘 저와 서울판 BeforeSunrise를 찍어 보심은 어떨까요?" 간단하다. 이제 Before Sunrise의 멋진 대사를 떠올리며 한국판 '동트기전'을 찍는 것이다. 멋진 장소를 뚜벅뚜벅 걸어다니며 멋진 대화를 나누는 것이다. 그들의 만남은 INTP형과 INFJ형의 만남인 것 같기도 하다. 둘의 성격이 반대로 설정되어도 재밌을 것 같다.